Use these cards to introduce students to letter sounds, blends, dipgraphs, and dipthongs! Use this product to build words with your whole class, ask small groups to spell words from word families, or use each set one-to-one to engage a single student. 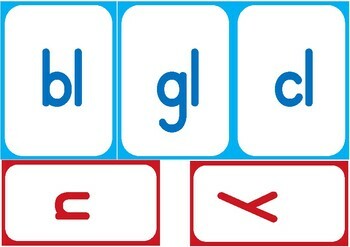 I have included a suggested course of study for the phonics cards. 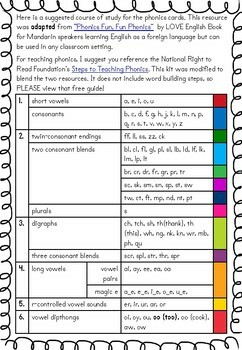 For teaching phonics, I suggest you reference the National Right to Read Foundation’s Steps to Teaching Phonics. This kit was modified to blend the two resources. It does not include word building steps, so PLEASE view that free guide! **This resource was adapted from “Phonics Fun, Fun Phonics” by LOVE English Book for Mandarin speakers learning English as a foreign language but can be used in any classroom setting! **This document is formatted to fit an A4 size paper, select “Scale Fit to Page” if printing on letter paper.